You may have heard the phrase before, but maybe you never really stopped to understand its meaning or get down to how it works. What is it? How can it help you? Is it for real? 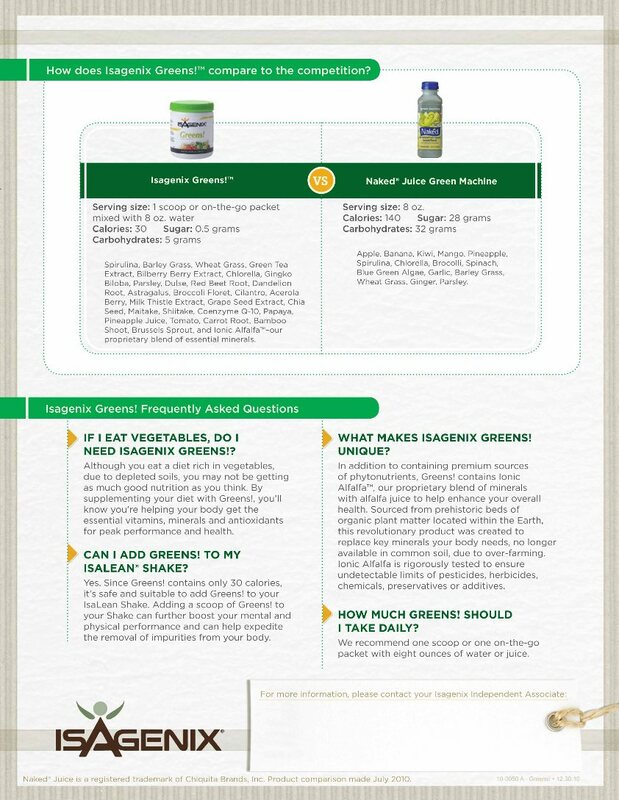 We’ve compiled a list of the most frequently asked questions about Nutritional Cleansing, and the answers may just surprise you. What exactly is Nutritional Cleansing? In essence, Nutritional Cleansing involves nourishing the body with nutrients that assist in clearing out unwanted substances from your body. 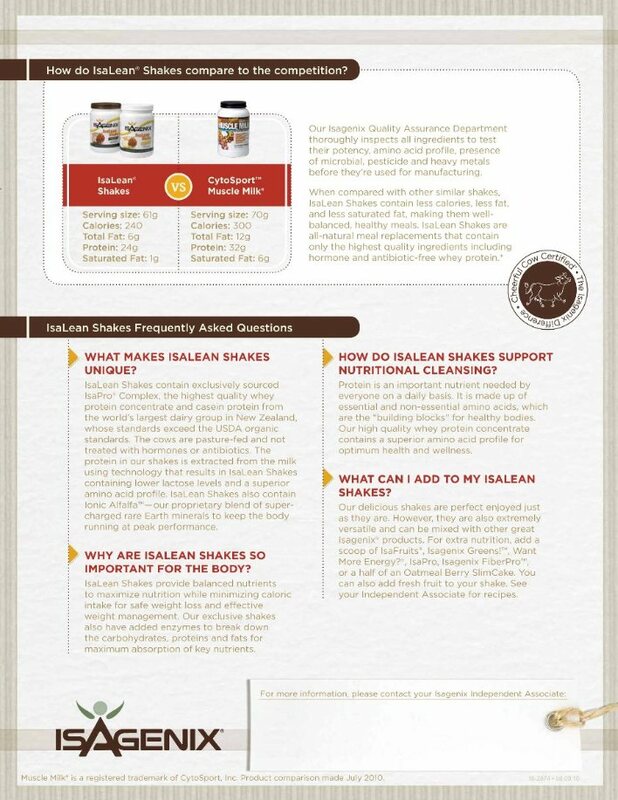 Nutritional Cleansing is not the same as colon cleansing, which is based on using fiber or laxatives to shed gunk and foreign substances from your colon. Instead, Nutritional Cleansing involves using nutrition to help your body perform at its best by ridding it of harmful substances, naturally. 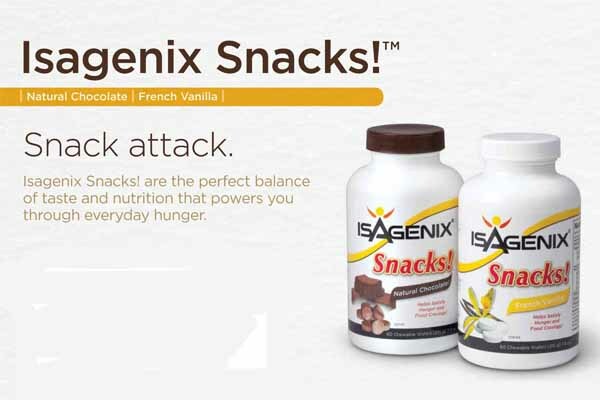 The Isagenix Nutritional Cleansing systems use natural ingredients to assist your liver and cells in ridding the body of harmful chemicals to help you feel healthier and more energized. 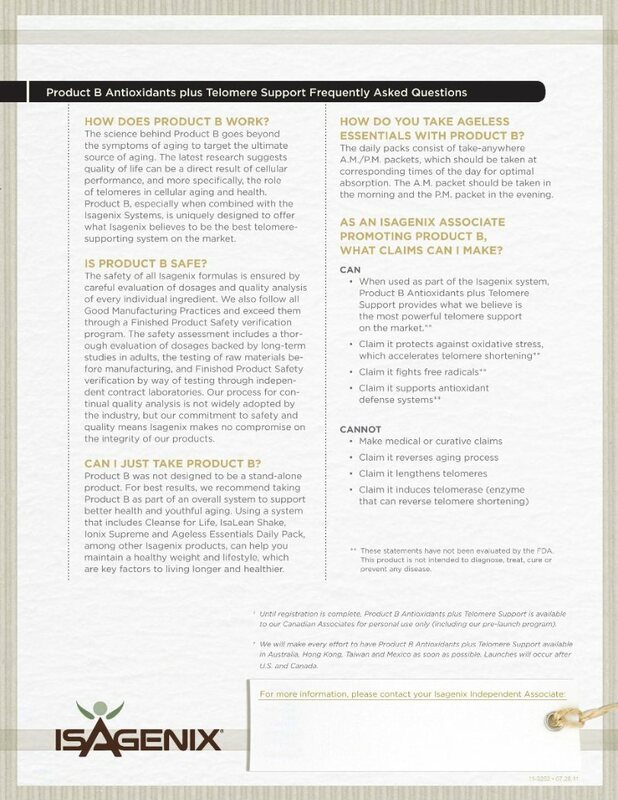 Cleanse for Life® includes key ingredients to help your body naturally cleanse itself of harmful impurities on a cellular level while nourishing it with more than 27 vital nutrients, antioxidants, natural botanical extracts, teas, vitamins and minerals. As a side benefit, performing deep cleansing can even help you lose weight. Isn’t it just a fancy juice? Well, it does taste great like a juice, but it’s much more than that. Unlike some one-hit wonder juices that use a single berry as their main ingredient (goji, açai, noni, pomegranate fruits, etc. 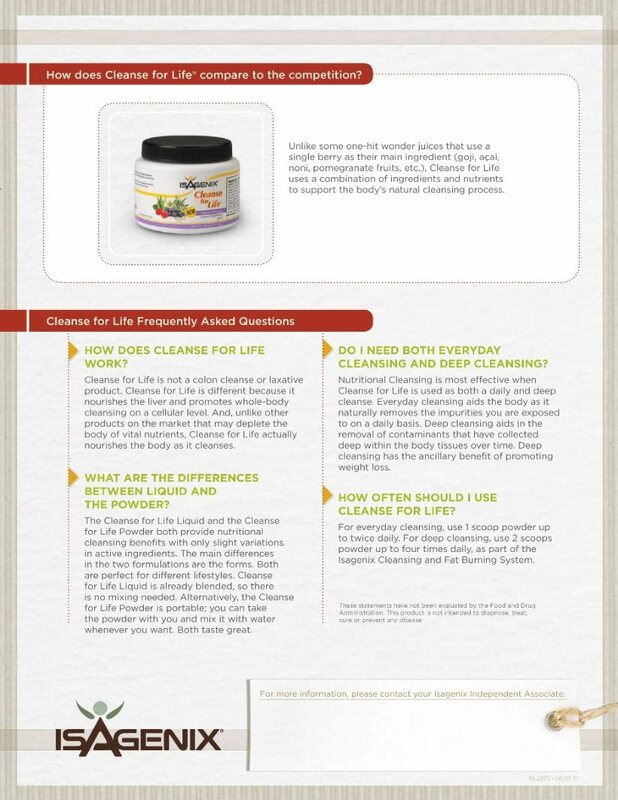 ), Cleanse for Life uses a combination of ingredients and nutrients to support the body’s natural cleansing process. 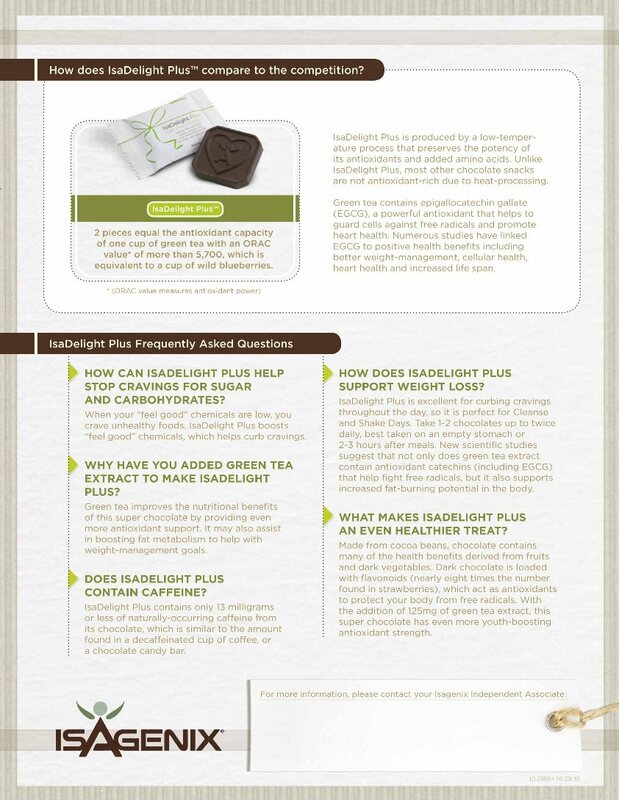 When you read the ingredients, you will see that it contains a powerful combination of antioxidants, herbs, vitamins and minerals that work to help you feel refreshed and ready to tackle each new day. We’ve spent years perfecting the formula in Cleanse for Life to help give you optimum performance and deliver benefits far beyond what one- and two- ingredient formulas can offer. 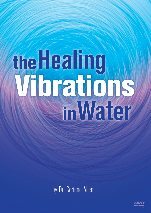 Why does your body need cleansing? Every day our bodies ingest all different kinds of chemicals, toxins and impurities. Not only that, but our bodies are also constantly giving off what are known as free radicals, or negatively charged molecules that attack your body’s cells. 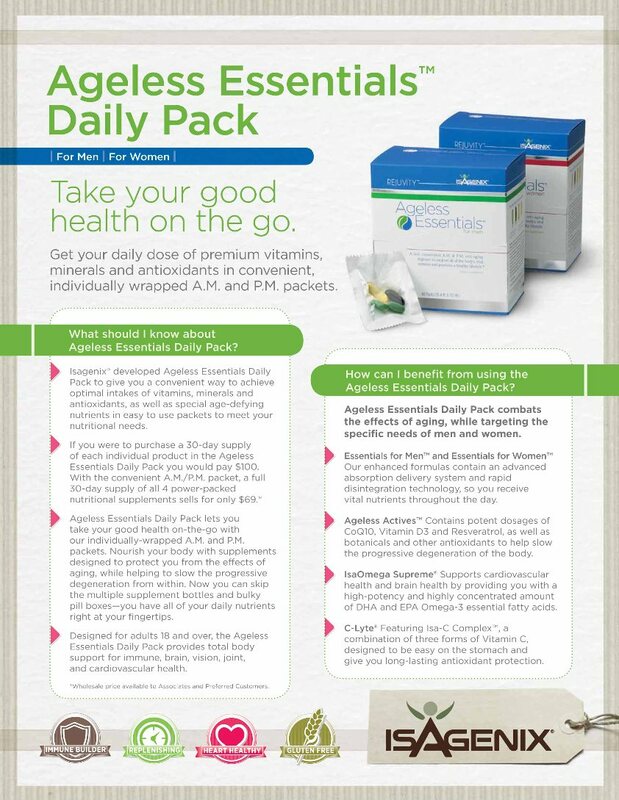 These free radicals can happen as a result of environmental challenges such as pollution or even your normal metabolism and exercise. Nutritional Cleansing helps rid your body of these toxins, while at the same time flooding your system with antioxidants — free radicals’ worst nightmare. 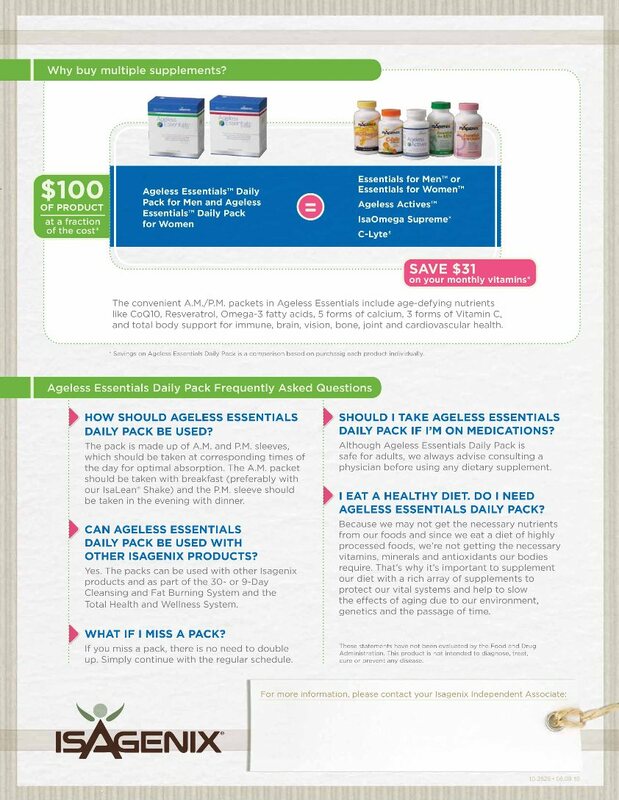 What other benefits can I get from Nutritional Cleansing? 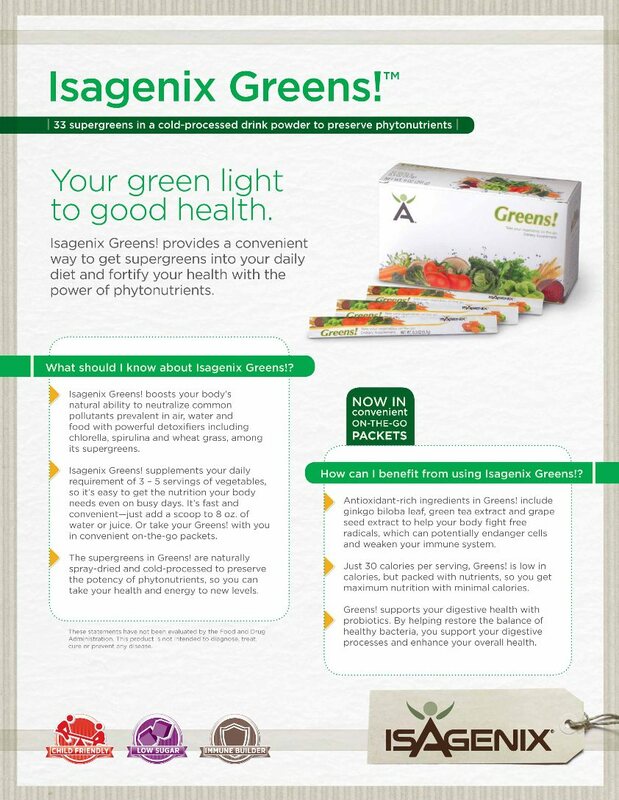 Do you feel sluggish during the day? Feel like you can’t get through the afternoon? Do you often experience the 3 p.m. slump? 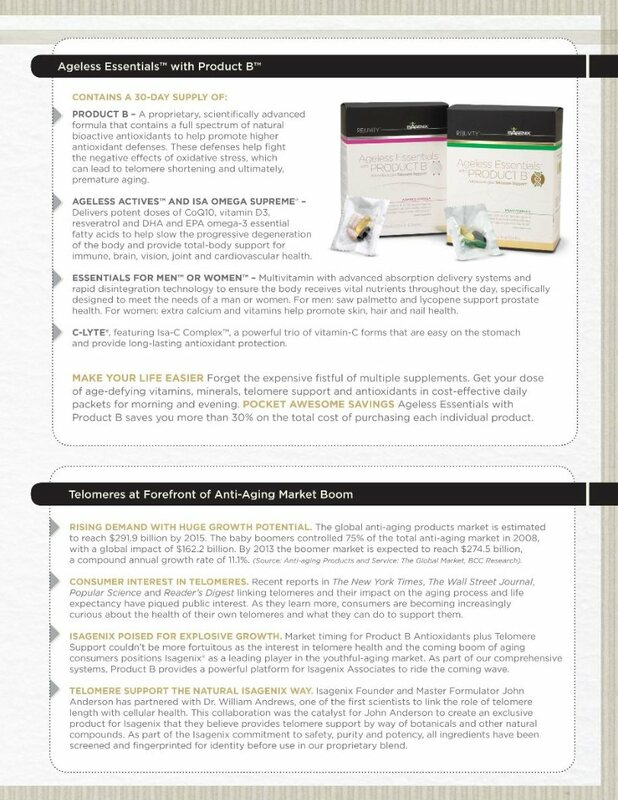 These are all areas where Nutritional Cleansing can make a difference. Besides helping you lose weight and rid your body of toxins, Cleanse for Life can help you experience increased energy, feel more alert and focused during the day and also help improve your mental and physical performance. Anti-Aging benefits. Age isn’t your only enemy. 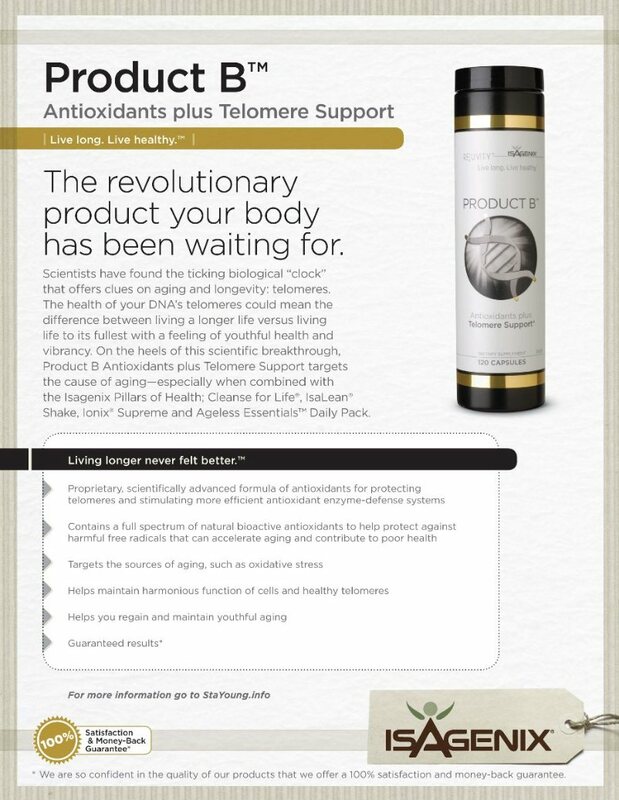 Environmental impurities and nutritional deficiency can lead to premature aging both internally and externally. By feeing the body free radical-fighting antioxidants, Nutritional Cleansing helps to offset the effects of toxins, which can accelerate aging. It’s important to always examine anything you put into your body. 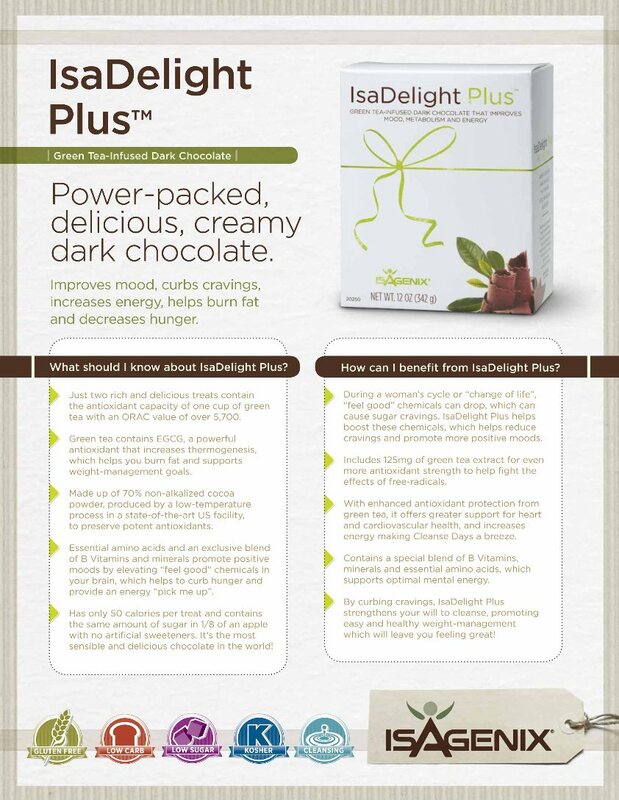 That’s why we’ve only added all-natural, safe ingredients to our Nutritional Cleansing systems. 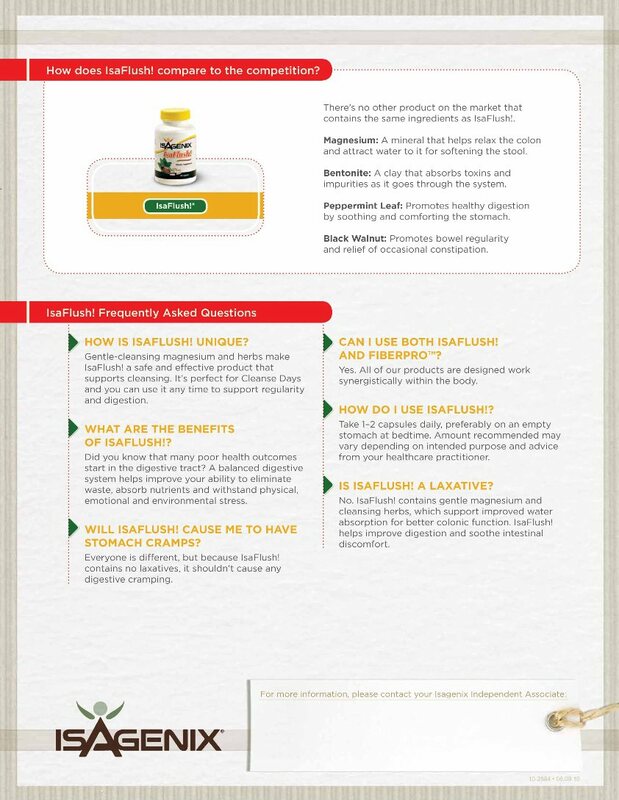 Cleanse for Life contains no artificial additives, flavors or other ingredients that can mess with your metabolism. What’s the difference between daily cleansing and deep cleansing? Daily cleansing naturally helps protect your body from impurities you are exposed to every day — pollutants, chemicals, free radicals and so on. This helps keep you performing at your best. Over time, some impurities may not get detoxified and cleared out through your body’s natural processes. These impurities bury themselves in your cells and tissues, normally staying there and slowing down your metabolism over time. Deep cleansing gives your digestion a rest while also allowing the liver to detoxify thanks to cleansing nutrients. 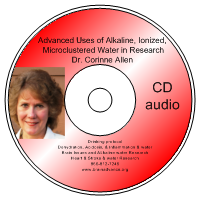 These nutrients get down deep into your system, ridding contaminants that have collected within your body over time, thus helping your eliminatory systems function effectively. Deep cleansing also creates the accompanying benefit of stimulating weight loss. 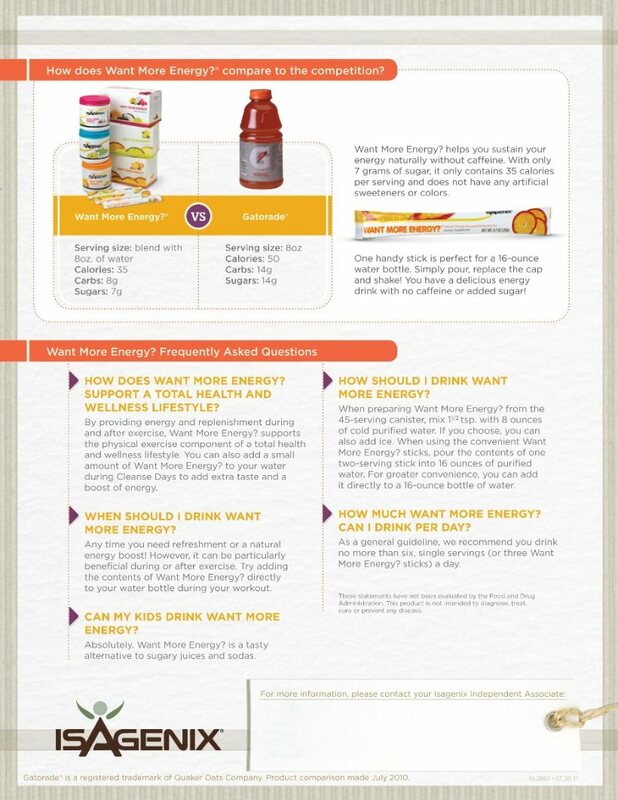 How often should I use Nutritional Cleansing? For everyday cleansing, drink Cleanse for Life two times daily. 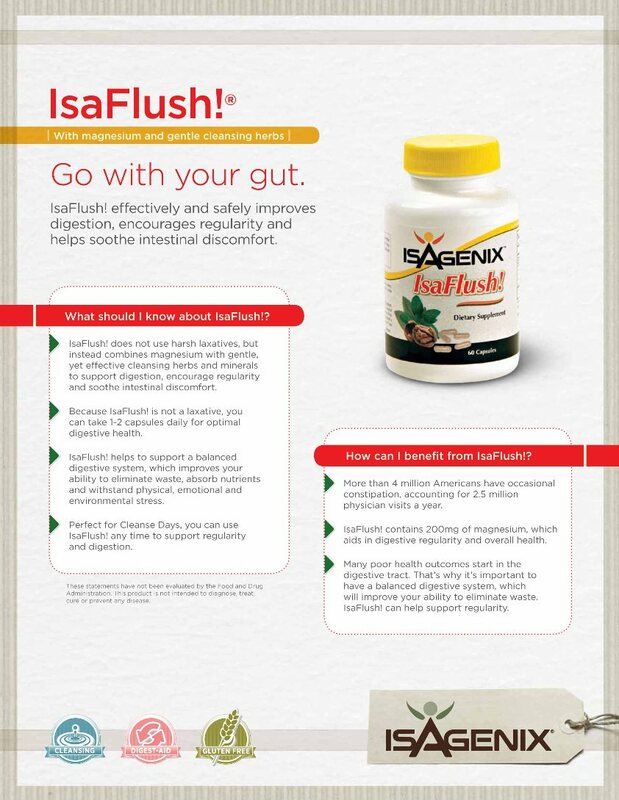 For deep cleansing, use four times daily as part of the Isagenix Cleansing and Fat Burning System. I’ve heard of Nutritional Cleansing, but what makes Cleanse for Life different? Other cleansing products or systems claim only to cleanse part of the body, like the colon, kidneys or liver. Cleanse for Life works for your whole body. Also, Cleanse for Life works with your body on a cellular level, rather than just flushing out your digestive system like some diuretic products or programs out there. And, unlike other products on the market that may deplete the body of vital nutrients, Cleanse for Life actually nourishes the body as it cleanses. Plus, our new, state-of-the-art manufacturing and extraction techniques just made Cleanse for Life Natural Rich Berry powder even more powerful! 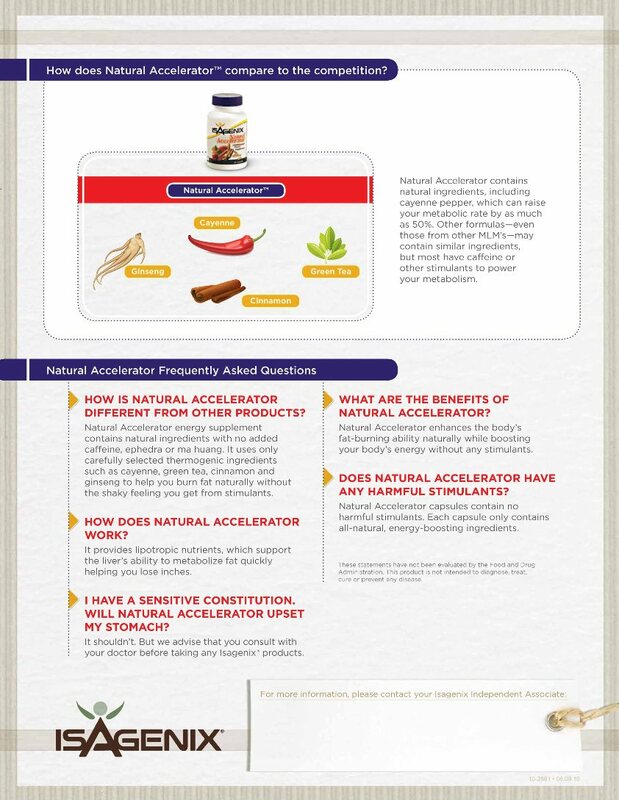 The potency of each rare, no-compromise ingredient has increased by up to 2- to 3-times its original potency level because of the improved manufacturing and extraction process that pulls all of the phytochemical properties from the botanicals at the cellular level. 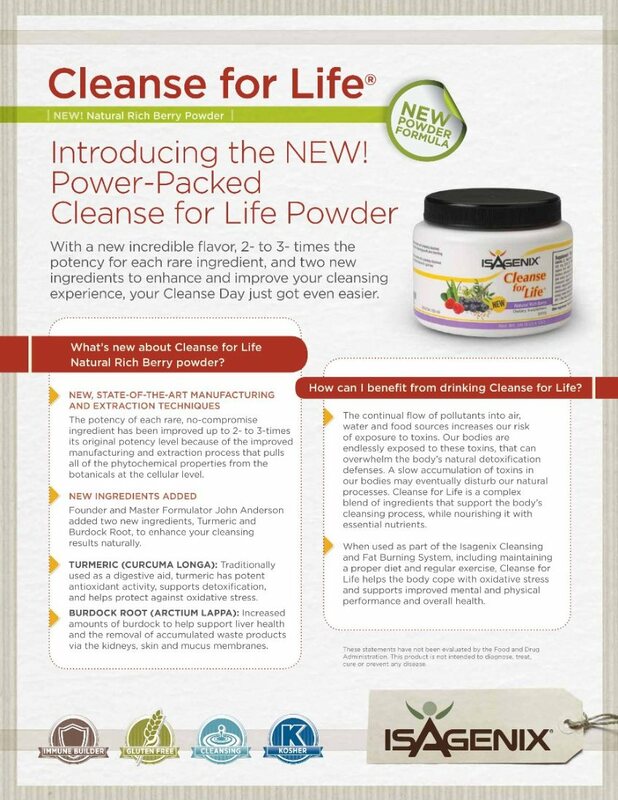 Founder and Master Formulator John Anderson also added two new ingredients to the Cleanse for Life Natural Rich Berry powdered formula, Turmeric and Burdock Root, to enhance your cleansing results naturally. 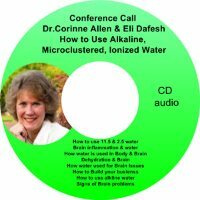 To learn more, visit CleansedforLife.com. 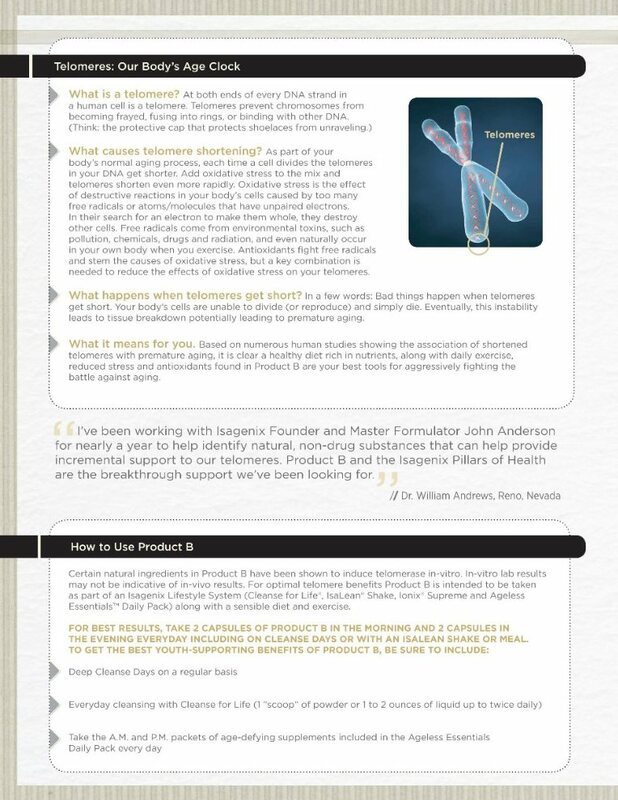 Isagenix is on the cutting-edge of scientific research and our next evolution in Cleanse for Life&reg; powder is proof! 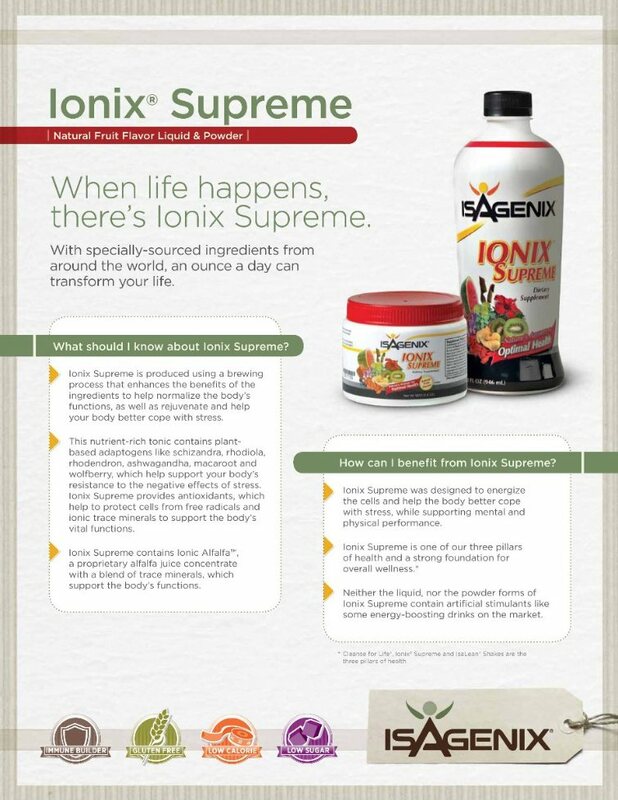 This convenient powder already includes key ingredients to help your body naturally cleanse itself of harmful impurities on a cellular level while nourishing it with more than 27 vital nutrients, antioxidants, natural botanical extracts, teas, vitamins and ionic trace minerals. Now the new Natural Rich Berry Cleanse for Life features a higher concentration of bioactives for increased potency for cleansing at the cellular level and greater protection against oxidative stress. Plus, new ingredients burdock and turmeric support liver health and offer a protective effect against toxins. With naturally-sweet ingredients such as bilberry, blueberry and raspberry, this newly-enhanced fruity powder will not only give you improved cleansing results, but the delicious flavor will make your Cleanse Day even more enjoyable! 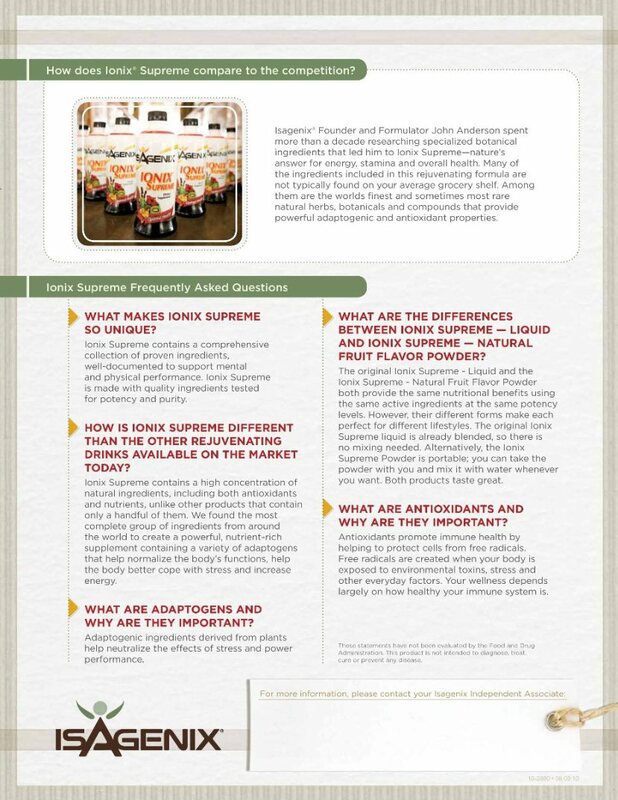 Why use Cleanse for Life Natural Rich Berry Powder? How can Cleanse for Life Powder change your life? * These statements have not been evaluated by the Food and Drug Administration. 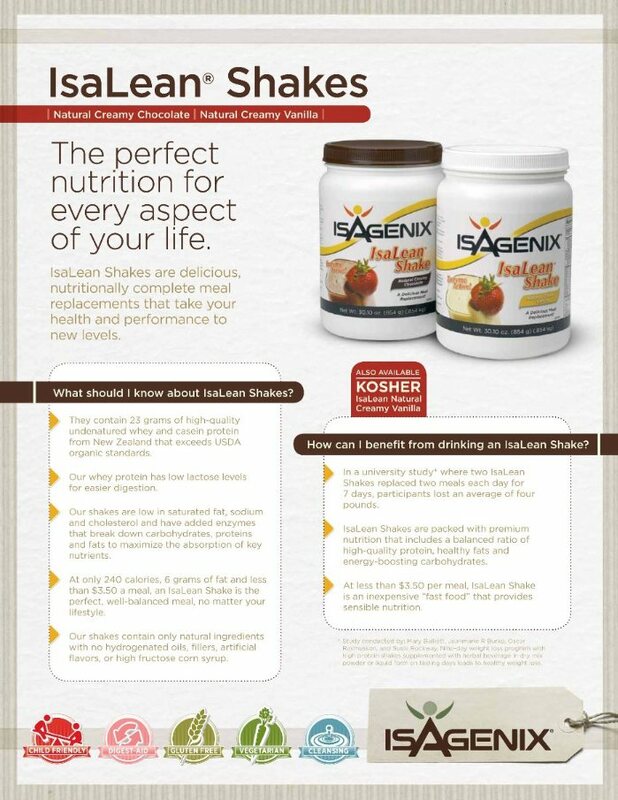 Isagenix programs and products are not intended to diagnose, treat, cure, or prevent any disease. 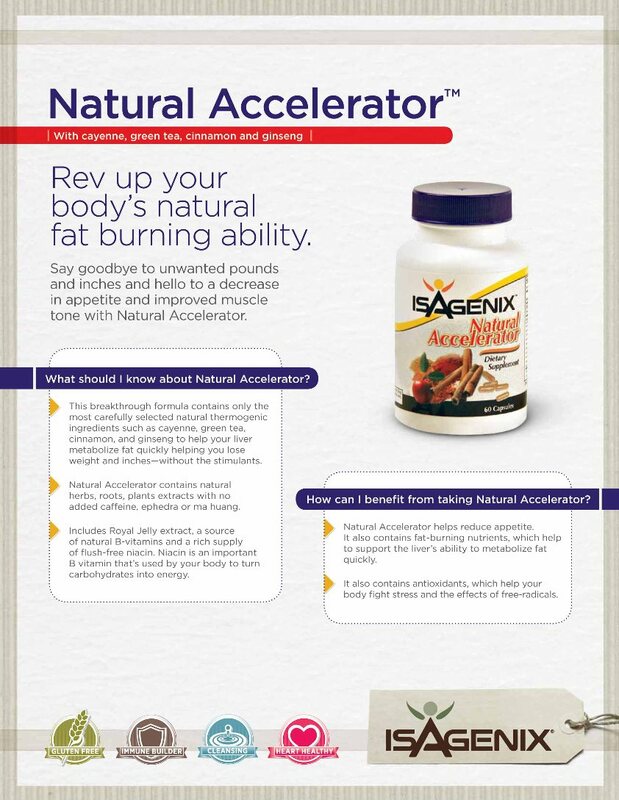 You’ll have 3 different schedules to follow to get started on the accelerated Isagenix cleansing program. Snack Ideas: 1/8 organic apple or one washed in 11.5 Kangen water; or a few celery stalks, can add almond butter with apple or celery stalks: I hard boiled egg; or up to 6 almonds (unsalted and raw). Note: Times can vary depending on what time you start in the morning. Results are best when you follow the plan as laid out! Any QUESTIONS and SUCCESSES call we want to hear from you!